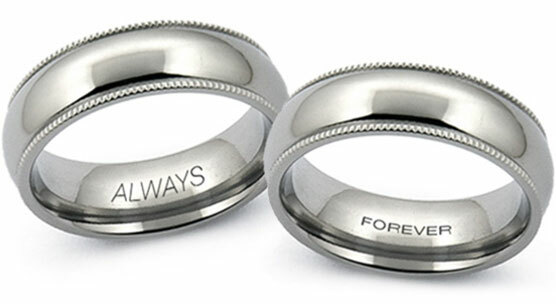 Domed tungsten carbide ring with precious metals inlays. 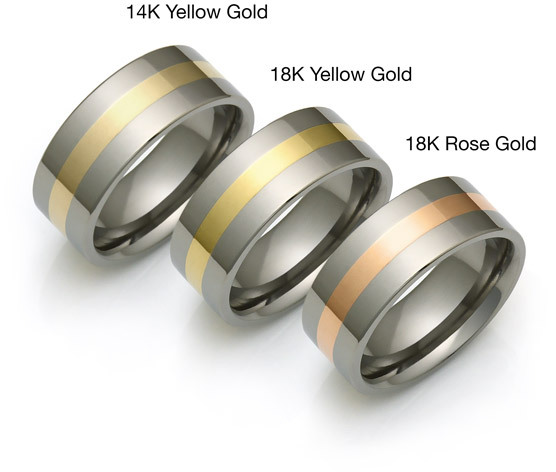 Available with 14K White, 18K Yellow or Rose gold, Platinum, and Sterling Silver inlays. The inlay metal is approximately 1/3 the width of the ring. Available 6mm and 8mm wide. The thickness of this ring is approximately 2mm (6mm width) and 2.2mm (8mm width). We ordered a 5-204 tungsten carbide / gold ring to replace an identical one which we'd ordered 4 years ago but which had tragically been lost in the ocean. 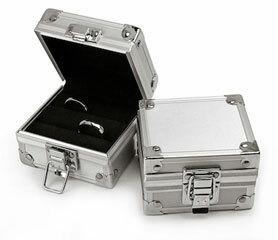 Anton was helpful in looking up our previous order and assuring us that it was the same ring. 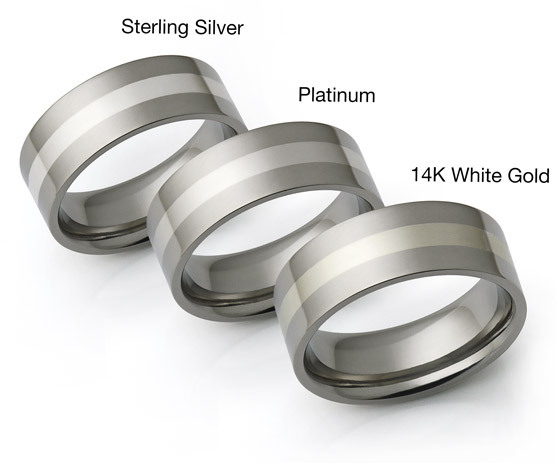 We received the sizing kit, made sure we had the right size, and after confirming the order, received the ring in a reasonable amount of time. We are very pleased with the quality. The only change I would suggest is that the webmaster tweak the ordering page to clarify that if you request a sizing kit, your ring won't be shipped until you receive the kit and confirm the order. This, of course, is common sense - but since there is no formal method for confirming the order (we ended up emailing Anton), the process is a bit ambiguous. My new tungsten and 18K gold ring arrived today, only a few days after I placed the order. The ring fits perfectly. It's very highly polished and projects a high class look. I am very satisfied and hope to do business with you again. I've had this ring with the platinum inlay for just over 2 years now. The tungsten is as shiny today as the day I got it. The platinum inlay shows scratching, as any other metal will, but the tungsten is just brilliant and without a scratch. Although the platinum inlay is pretty scratched up, there is still a shine on it. This ring looks fantastic and is a great buy. Got the polished white gold and it's very nice. Very subtle contrast with the tungsten. Fits very well. The engraving came out very nicely. My fiancee loves it and can't wait for our wedding when she puts it on me. The level of communication is also superb. All my questions answered by the next business day if not within an hour or two. I went with a brushed inlay, and the contrast with the tungsten carbide is great. The pictures really don't do the tungsten justice: in some lighting conditions, it takes on an awesome reflective quality that looks great. I'm very happy with the ring. 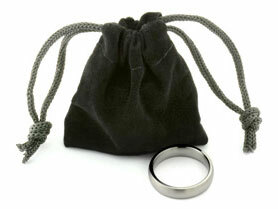 I had to send the ring back due to size issues, and Avant Garde quickly replaced it. Great service! I had a very special custom request and this was the only company I could find who was willing to help me. I had a plain white gold ring with significant sentimental value. I wanted that ring used as the inlay for my husband's wedding band. I got this ring with the polished finish and brushed white gold inlay using the gold from my band. 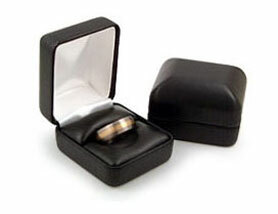 The ring was a surprise for my husband and he didn�t see it until the wedding ceremony when the preacher pulled it out and presented it to him. The moment my preacher described what I had done to the ring and the significance that it had was priceless. My husband said it was the sweetest gift anyone could have ever given him and Avant-Garde made that possible. People asked to see his ring more than mine that night! The ring exceeds my expectations and the fit is amazing on him. It looks great and it was a great value. The customer service was phenomenal. Thank you!